The management of CM is more complex than EM, as it is often resistant to standard treatments with resultant additional costs compared to EM. The mean (SD) annual cost per CM person ($8243 [$10,646]) was over three times that of those with EM ($2649 [$4634]). Both direct medical costs and cost of lost productivity were substantially higher in CM than EM . In addition to financial costs, the social costs and personal impact of CM often leads to severe disability for those with CM [6, 7]. This is especially true for females, with the annual prevalence of CM in women being 1.7–4.0% compared to men (0.6–0.7%) [8–11]. Those women aged between 18 and 49 years of age are the most affected across the range of measures. In one study, CM sufferers were found to be three times more likely to have lost work and have reduced household productivity than those with EM (58% compared to 18%) . People with CM are also much more likely to report “very severe headache-related disability” as measured by the Migraine Disability Assessment Scale (MIDAS) than those with episodic (24.8 and 3.2% respectively) [13, 14]. Despite the suggestion that migraine is a syndrome with multiple pathological mechanisms which support a multi therapeutic approach rather than a single approach [15–17], the mainstay of treatment for CM is pharmacological. However, some patients do not want, or cannot, take some prophylactic medications such as Topiramate due to restrictions in its use . Currently, OnabotulinumtoxinA (Botox) is the only specifically licensed treatment for CM in the UK . Although its mechanism of action is unclear, studies have demonstrated that injecting specific sites on the head and neck produce significantly beneficial effects in CM patients. 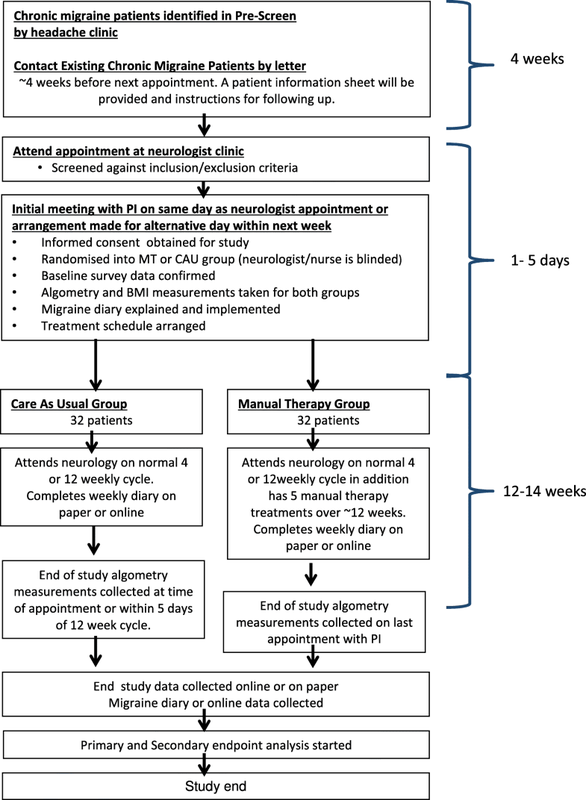 One study concluded that 32% of CM patients achieved a 50% reduction in headache days and a 50% reduction in migraine days, with NICE guidance recommending a 30% reduction in headache days as a measure of success in Botox studies . Although similar clinically significant reductions in the Headache Impact Test (HIT 6) scores are seen with Botox and Topiramate interventions, Botox has fewer side effects and higher adherence rates [21, 22]. However, the efficacy of Botox in those patients who benefit only partially or not at all from Botox, and its relatively high cost, are barriers to an increased uptake [23–25]. Therefore if adjunctive therapies, especially those with fewer side effects and relatively low costs could be utilised, this may increase the benefit to more of those with CM. Currently there are two theories in existence relevant to this study of manual therapy in the management of chronic migraine. One is that migraine is, in part, an abnormal response in those genetically pre-disposed, to nociceptive input involving the nerves of the upper cervical spine (C1, C2 and C3) and associated joints and muscles. This leads to exaggerated sensitisation of the trigeminal pathway and subsequent face, neck and head pain [28–30]. Various models of MT and pain reduction exist which involve biomechanical, neurophysiological and psychological components, either individually or in combination. However all of these models consider that MT may work by activating descending inhibitory pathways via different levels of the spinal cord [43–45]. The common relationship of central sensitisation, the cervical spine, and pain disorders (see Table 1) would suggest MT may have utility in the management of CM. In terms of potential as an adjunctive treatment, MT has been shown to reduce pain and have a direct effect on the mechanics of the cervical spine that results in functional improvements [46–48]. MT has also been shown to increase local pain pressure thresholds, which are used to detect central sensitisation [49, 50]. Consequently, MT may reduce cutaneous allodynia and improve the efficacy of current approaches to treating CM. The study is powered at 80% (α =0.05) to detect a mean difference of 3.7 points in HIT6 before and after treatment. A pooled calculation of standard deviation (SD) of 4.91 was calculated for the Headache Impact Test (HIT6) from the analysis of major studies in chronic migraine [7, 54–59]. Although this requires 29 participants in each group, 32 will be recruited to allow for attrition that may be experienced over a 12 week period. The study is designed to be pragmatic and to balance the needs of efficacy and effectiveness in clinical research . 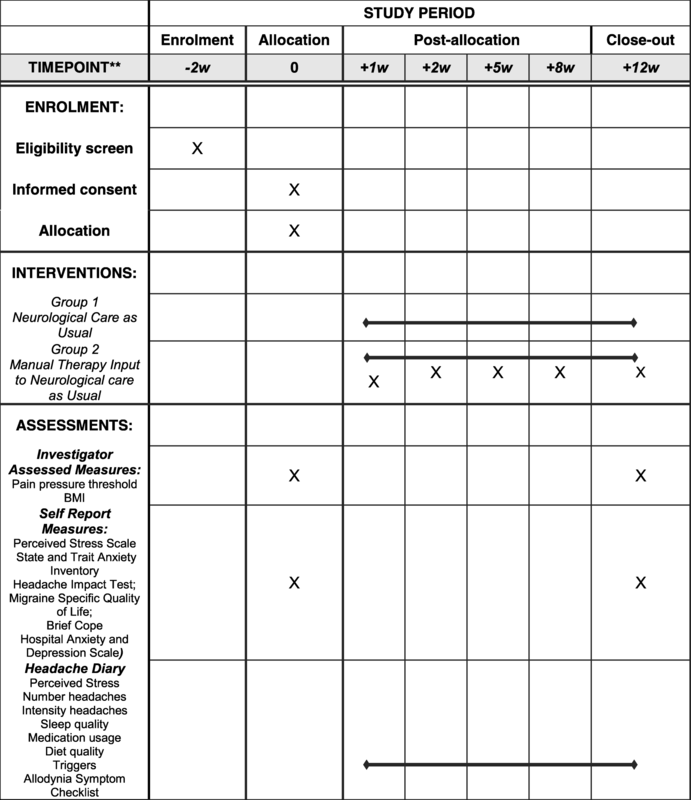 The HIT 6 score is used in this study as the primary outcome measure, as this is the only headache disability measurement tool with established validity in CM [54, 57]. The number of headache/migraine days will be collected as a secondary measure using a headache diary, a well established and valid measurement instrument [68–70] and recommended by the IHS.